"Most people don't have any idea about the complicated life going on inside a hive. Bees have a secret life we don't know anything about." ~Sue Monk Kidd, "The Secret Life of Bees"
Not required, but suggest you have a roll of duct tape in case you rip a hold in your suit. Positive attitude with a willingness to learn! 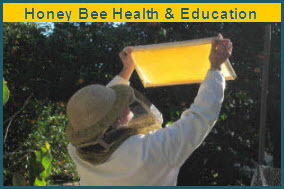 Most of the information you need to attend our Beekeeping 101 Classes can be found here. Class location, parking information and specific class information will be e-mailed to registered participants the day before class. Beekeeping is weather dependent. All classes will be held outside. While we make every effort to stick to our schedule sometimes class content will change due to the weather (rain, fog, cool temperatures, excessive heat, change in weather) and/or needs of the bees. Registration is required to attend classes. Registration for classes must be done on-line. Click here to register for all 8 classes or you can individually register for each class you want to attend. We suggest that you attend all 8 classes to get the most out of the classes. Parking for Class: Please park on Topanga Canyon Blvd. No parking restrictions on Sundays. This is an ‘educational’ class, not a ‘hand’s on’ class. The third class begins the hand’s on classes (when we open the beehive). You do not need a bee suit or protective clothing for this class because we’re not opening a beehive. Class Topic: What to plant in a bee friendly garden. The importance of well-built hive equipment. How to build/assemble your own Hive Equipment. The life cycle of the colony and basic bee biology. How to install a package or nuc of bees into your equipment. Class Topic: To Be Determined based on when packages of bees are scheduled for pick up. Typically, the April class is the first class that we go into the Apiary and open up hives. Once we have a date for package pick up, we will have a better idea as to what this class topic will be. Probable topic for class will be the life cycle of a colony and basic bee biology. Hive inspection techniques – what to look for on you first hive inspection after installing your package of bee. Class Location: Chatsworth, CA – The Valley Hive Apiary – details will be sent out to registered participants. Parking for Class: Details will be sent out to registered participants. Price: Suggested donation of $20 per person per class or $100 for all 8 classes. LACBA is a 501c3, your donation is tax deductible. Class Topic: Pest & Diseases – Learn about things to watch out for. Hive inspection techniques – what to look for during your hive inspection. Compare the growth of your colony to ours. Class Topic: Testing for Varroa Mites. Hive inspection techniques – what to look for during your hive inspection. Compare the growth of your colony to ours. Class Topic: More practice on testing for Varroa Mites. Hive inspection techniques – what to look for during your hive inspection. Compare the growth of your colony to ours. Typically your first year you don’t get honey, but just in case you do techniques on how to extract honey. Class Location: Chatsworth, CA – Part 1: The Valley Hive Apiary Part 2: Extraction Demonstration – details will be sent out to registered participants. Class Location: Chatsworth, CA – Part 1: The Valley Hive Apiary – details will be sent out to registered participants. September: No Bee Class, due to the Los Angeles County Fair. 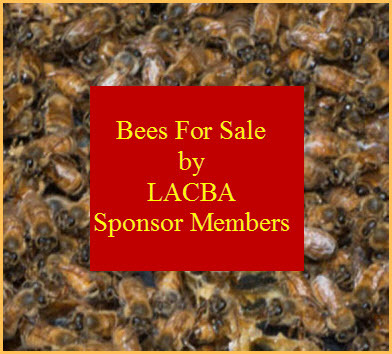 Please give back to the bee community and donate a 5 hour shift to work at the LACBA Bee Booth at the Los Angeles County Fair. Class Topic: Culmination of what you have learned this year. Be prepared for a final exam. Class Location: The Valley Hive – 10538 Topanga Canyon Blvd, Chatsworth, CA 91311. The Los Angeles County Beekeepers Association Beekeeping Class 101 first began in 2009 at Bill’s Bees Apiaries in the foothills of the San Gabriel Mountains. We'd like to thank Bill Lewis and Clyde Steese of Bill's Bees for making their apiaries available to us year after year and for sharing their experience, knowledge, and time with us. Their dedication to the art and craft of beekeeping made these classes available, affordable, and highly enjoyable. Their steadfast adherence to Best Management Practices for the bees and beekeepers continue to make keeping bees an adventure in responsible beekeeping. We’d also like to thank the experienced beekeepers from the LACBA who give of their knowledge and time to make these gatherings of beekeepers intimate groups of hands on learning. Thank you to all the beekeepers who have participated in our Beekeeping Class 101 over the years. Our Beekeeping Class 101 grew from under 20 newbees in 2009 to over 200 in 2016. There's nothing like the beauty of standing on top of a mountain, surrounded by millions of honey bees. We are forever grateful to Bill and Clyde for giving us the appreciation for the gift of the bees!